Economically upgrade your existing Toro system. 654 * Must have ribbed bodies manufactured after 1992 to use Part/Full circles. 655 * Must have ribbed bodies manufactured after 1992 to use Part/Full circles. 670 * Must have ribbed bodies manufactured after 1992 to use Part/Full circles. 684 * Must have ribbed bodies manufactured after 1992 to use Part/Full circles. 754 * Must have ribbed bodies manufactured after 1992 to use Part/Full circles. 784 * Must have ribbed bodies manufactured after 1992 to use Part/Full circles. 785 * Must have ribbed bodies manufactured after 1992 to use Part/Full circles. 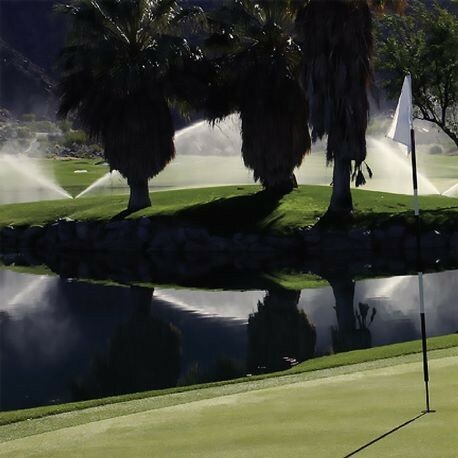 With the industry’s largest selection of high performance nozzles and TruJectory™ adjustment the FLEX800 allows you to put water precisely where you want it for maximum distribution uniformity. 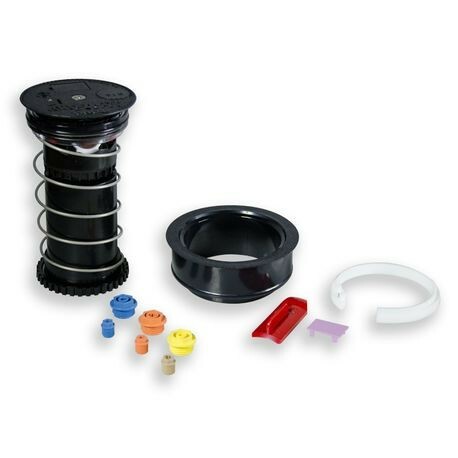 Industry's largest nozzle selection - Nozzles from 42’ to 100’ radius plus a wide assortment of back nozzles lets you put the precise amount of water exactly where you need it. All nozzles threaded in from the front. 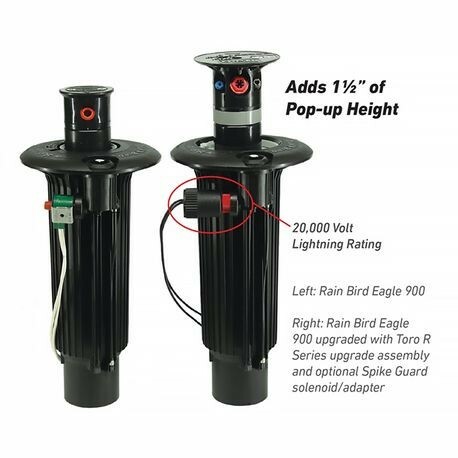 20,000 Volt lightning rating - Spike-Guard™ solenoid virtually eliminates the need for replacements in high lightning areas. 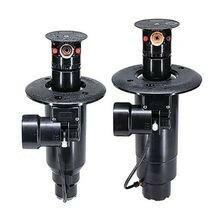 Draws half the amperage of traditional solenoids so you can run twice as many sprinklers simultaneously, reduce the cost of wire during initial installation or increase the distance from controller to sprinkler. 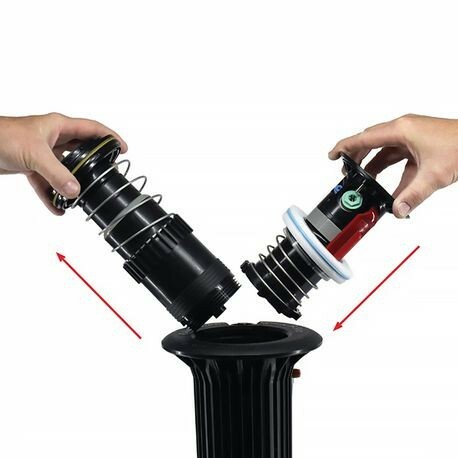 Adjustment with no disassembly - Toro exclusive, simply pull up the riser and ratchet it to the precise position you want to water. 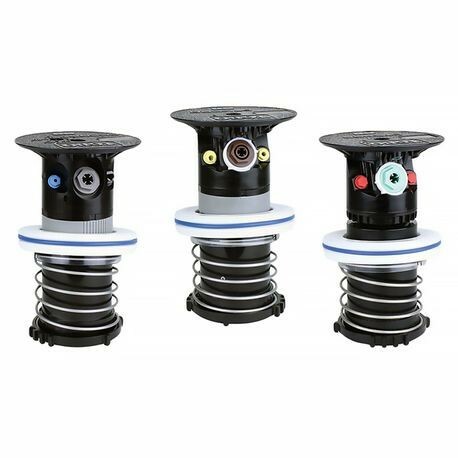 True part and full-circle in one - (40° - 330° part circle) These sprinklers can be full circle or part circle allowing you to adjust the area of coverage to match your seasonal needs or meet water rationing mandates. Ratcheting riser allows riser positioning without riser removal. 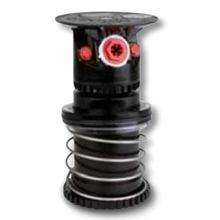 4 main nozzle combinations included provides a wide range of radius and flow capabilities. All nozzles threaded from the front with no other disassembly required.